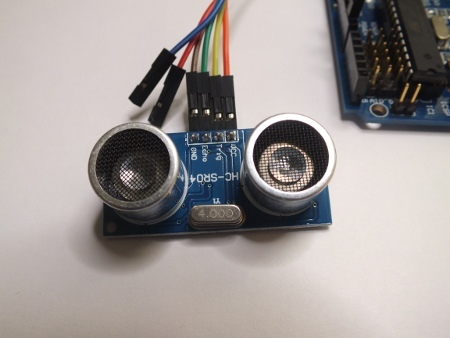 I bought some time ago HC-SR04 Ultrasonic Sensor Distance Measuring Module to play with ultrasound distance measurements with Arduino Duemilanove 2009 Atmega 328P SCM Board. The working principle of the HC-SR04 Ultrasonic Sensor Distance Measuring Module when the module get trigger “start” pulse, it sends eight 40khz square wave pulses and automatically detect whether receive the returning pulse signal. If there is signals returning, through outputting high level and the time of high level continuing is the time of that from the ultrasonic transmitting to receiving. So the pulse length tells the time of flight from sensor to measured distance and back. The HC-SR04 Ultrasonic Sensor Distance Measuring Module was wired to Arduino board with Male to Female DuPont Breadboard Jumper Wires (pretty useful accessory for prototyping with Arduino). 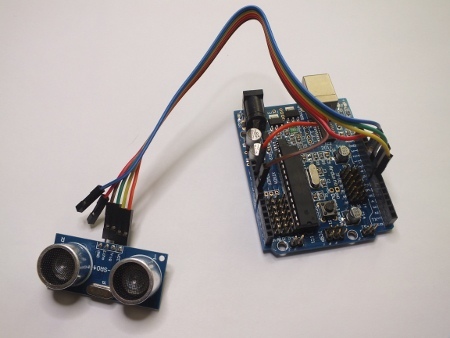 Arduino programming environment contains Ping example made for an ultrasonic range finder from Parallax. It detects the distance of the closest object in front of the sensor (from 2 cm up to 3m). It works by sending out a burst of ultrasound and listening for the echo when it bounces off of an object. The Arduino board sends a short pulse to trigger the detection, then listens for a pulse on the same pin using the pulseIn() function. The duration of this second pulse is equal to the time taken by the ultrasound to travel to the object and back to the sensor. Using the speed of sound, this time can be converted to distance. The HC-SR04 Ultrasonic Sensor Distance Measuring Module has a little bit different interface, because it had separate pins for trigger and echo. This means that I needed to modify the example source code (was not too hard). This code outputs lines with two numbers (inches and centimeters) separated by comma. The communications speed is 9600 bps. Everything worked well with TeraTerm. The output was two numbers per line separated with comma outputted at 9600 baud rare. The numbers tell the distance in inches and centimeters. Now time to try to get some graphs. This could be down in many ways, for example using Processing like in Graph example, Realtime Plot of Arduino Serial Data Using Python, Graphing with Excel or use application specifically made for this like SerialChart. I configured Arduino USB serial port number to COM2 and now SerialChart worked well. Now I can visually see what the sensor senses and also see the numeric values.